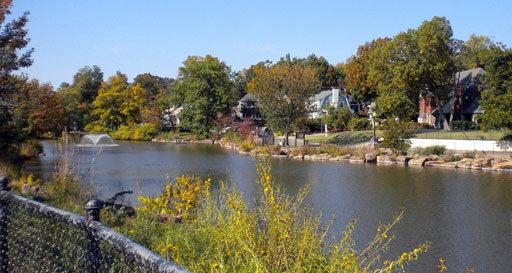 Swan Lake is the focal point of the district of the same name which includes the commercial area on 15th Street and extends to major arterials on the north, east, south and west. Two-story houses built around the lake from 1919 to the present represent a variety of architectural styles including Spanish, Georgian Revival and vernacular interpretations honoring the swan. Some are now duplexes. Most sit on high ground overlooking the city-owned lake. The remainder of the neighborhood contains bungalows, two-story houses, quadruplexes and six-plexes of stone, clapboard and stucco. The Swan Lake area has more two- and three-story, 1920 to 1930 multi-family apartments and duplexes than any other residential area in Tulsa. At one time, spring-fed Orcutt Lake was the watering hole for a ranch belonging to Colonel A. D. Orcutt, a member of Oklahoma’s first legislature. In 1908, a group of developers led by Colonel Orcutt’s son, Samuel A. Orcutt, purchased 25 acres in Orcutt Addition to build a park and an artificial lake. The amusement park, built by the lake in 1910, marked the end of a trolley line from downtown. Other park facilities included an enclosed dance pavilion, a swimming pool, and, later, a $7,600 roller-coaster. By 1917, Orcutt Lake Amusement Park had become a residential area and was renamed Swan Lake. By 1925, residential construction was well established. Since 1970, there has been a strong market demand by young, middle-class families who value the large houses, quiet, tree-lined streets, and the area’s proximity to the Utica Square shopping center, 15th Street, and downtown. From the outset of the development, interaction within the neighborhood among the apartments and the single family residential homes was a common occurrence that did not destroy the integrity of the neighborhood. Residential buildings on the west side of Utica Avenue just south of 15th Street were demolished in 1997 for commercial redevelopment. These properties were within the boundaries of the Swan Lake National Register District. The properties demolished were contributing resources within that National Register District, and the apartment buildings located at 1510, 1512, 1514, and 1516 South Utica Avenue were especially important because they were individually eligible for listing on the National Register. Swan Lake was placed on the National Register of Historic Places on February 20, 1998 under National Register criteria A and C. Its NRIS number is 98000140. Cultural Resources in the Tulsa Urban Study Area, by Kelly C. Duncan, edited by Annetta L. Cheek, Archaeological Research Associates Report #14, 1977: Christ the King Church, p. 34.